Along with the archers surveyed in The Definitive Dwiggins no. 33, W.A. Dwiggins created at least one archeress. She appears on the title page of his short story The War Against Waak,(Hingham, Massachusetts: Püterschein-Hingham, 1948). The story is the fifth in the Athalinthia series that he began writing in the mid-1920s. The archeress, labeled “Bellona”, is stenciled in magenta and rose. She faces to the left, seemingly oblivious to the presence of three men engaged in battle with spears and shields to her right. Despite the label of Bellona, Dwiggins’ archeress is not outfitted like the Roman goddess of war. She is not wearing armor and a helmet, nor is she carrying a sword and shield. 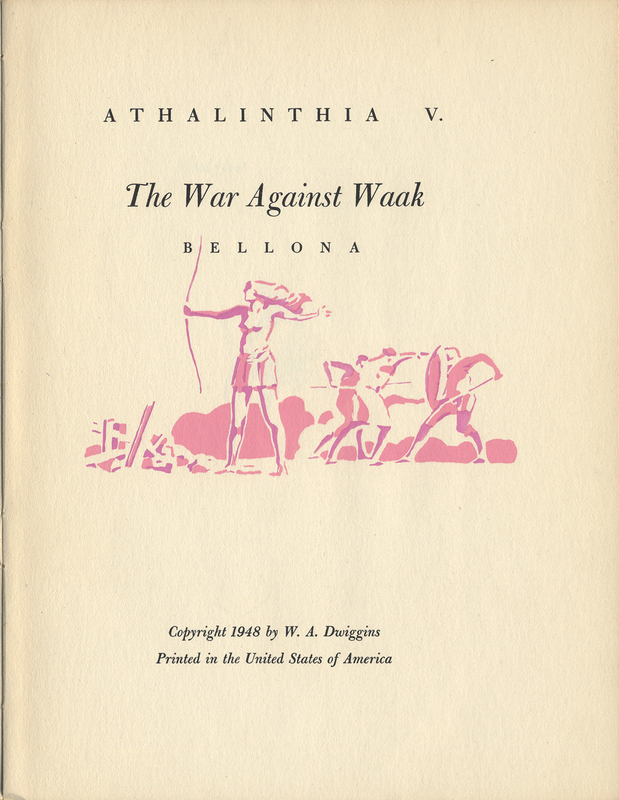 It appears that Dwiggins has visually conflated Bellona with an Amazonian warrior. Although the Amazonians were known for their archery skills, depictions of them in Greek art show them fully clothed instead of bare-breasted in the manner of Dwiggins’ archeress. Perhaps Dwiggins was basing his figure on Atalanta, a virgin huntress who was often shown as “an archer wearing Scythian boots, or as an Amazon archer in short chiton and helmet.”  However, I have been unsuccessful in locating a painting or illustration of Atalanta that matches this archeress in posture or costume. Title page for The War Against Waak by W. A. Dwiggins (Hingham, Massachusetts: Püterschein-Hingham, 1948). Illustration and typography by W.A. Dwiggins. 1. The seven Athalinthia stories (with their parts) as listed on the cover for The War Against Waak are: Syrillion (Prologue, Embassy to Ageb, The Thieves), Tirsapella, The Glistening Hill, Jade Carved Flamewise, The War Against Waak, Bronabejjia (First Sojourn, Second Sojourn, Third Sojourn), and The Drums of Kalkapan. Not all of them were printed in Dwiggins’ lifetime. 2. From Ancient Greek Costume: An Annotated Bibliography, 1784–2005 by Linda Jones Roccos (Jefferson, North Carolina and London: McFarland & Company, Inc., Publishers, 2006), p. 22.